As another early start is on the cards tomorrow morning thought I would post today as for once I am being super organised. Plus it means I can put off thinking about the heap of paper work thatâs growing by the hour around me. Talking of growing there is a trendÂ (and its rather a fabulous one) of replacing chrome nickel, pewter and whatever else you want to call them with good old-fashioned brass fixtures and fittings. Far softer and warmer on a space than their silvery counterparts I think itâs a fabulous way to go. Visually I so much prefer and for once no matter if your walls are pale (why may I ask)?? 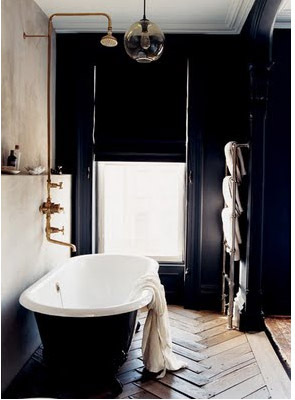 or dark (yay) then brass fixtures give a space a boutique hotel like vibe. Jenna Lyons has in my opinion nailed what the perfect bathroom should look like. Inky black walls with beautiful reclaimed fixtures in the softest gold. Reclamation yards are a fab place to get a bargain and many bathroom showrooms are now getting in on the bandwagon and producing brass versions, Waterworks being one of them. If I could I would replace all of mine in a nano second â but the hallway still isnât finished the front of the house is in dire need of a complete overhaul and thereâs an office and bedroom to work on. Oh a car to buy â my windows are now stuck in the open position which is just about okish in the summer but very bad for motorway driving am arriving to clients looking like I have just piled out of bed so bad is the hair with the wind!When thatâs all sorted its onto the taps although looking at the image below of Jennaâs place I want to forget all of the above and simply buy old fashioned taps right now. One of the most beautiful bathrooms on earth I say. Simple, beautiful and fabulous. 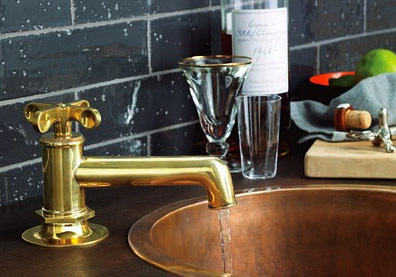 New in from Waterworks a beautiful brass tap (not sure I would team it with a copper sink) but hey the tap is great.